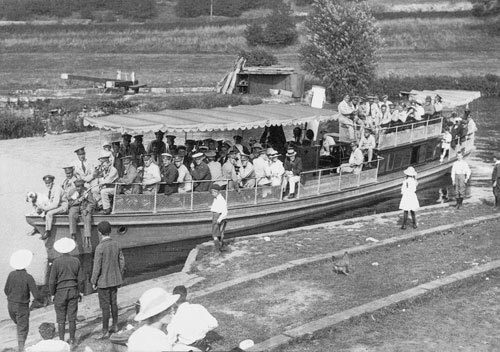 On this page we have photographs, information, stories and images about Saltford during the two world wars. 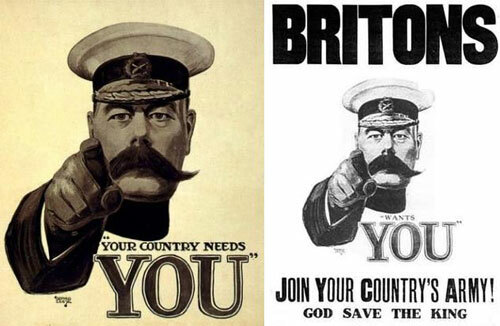 Three days after war with Germany was declared on 4 August 1914, Lord Kitchener made his first appeal for 100,000 volunteers. This unleashed a great wave of patriotism that spread throughout the country. Residents of Keynsham and Saltford were caught up in the patriotic response and on 5 September an excited crowd flocked to Keynsham's Drill Hall on Bath Hill to a meeting arranged to drum up recruitment. "The hall was crowded to excess, and great enthusiasm prevailed. Patriotic airs and songs were rendered by the Keynsham Town Band, and the assembly joined in heartily in the singing. Mrs McVitie rendered 'Land of Hope and Glory', the chorus of which was sung with fervour." Local dignitaries, including the sitting MP, Mr J King, the town councillors, churchmen and other VIPs, took to the platform and the Chairman, Mr H Graham Bush, opened the proceedings. "The meeting was held upon an historic and unparalleled occasion and the circumstances were such to attract the attention of every man, woman, and child of the British Empire. The German Emperor was determined to go to war and the reason England was in arms against Germany was because she was a nation of honourable men. (Applause.) England was a nation of warriors not of shopkeepers and she was going to win the fight. In conclusion, he said so capable was our Navy that English people could sleep happily in their beds without fear. (Cheers)." Despite the success nationally of Lord Kitchener's appeal more volunteers were required and another meeting was called on 8 March 1915. This was held again at Keynsham's Bath Hill Drill Hall with the Rev D Hatchard MA presiding. It is not recorded how many were recruited by those meetings. Article by Brian Vowles (The Journal of the Keynsham & Saltford Local History Society Series 2. No. 14. 2014 ). 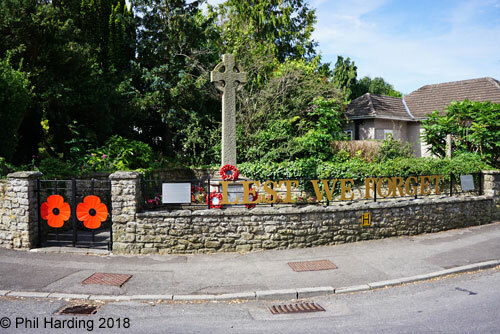 We should recognise that the loss of life to Saltford, 17 men died serving their country, would have made a significant impact on a small village like Saltford (then around 600 inhabitants). 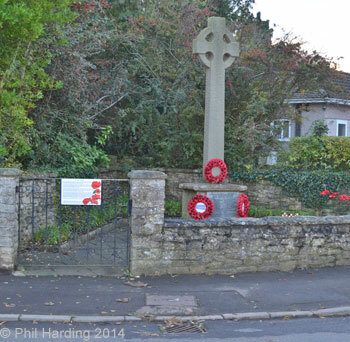 Information about Saltford's WWI casualties can be found below. Service Battalion of the Gloucs Regiment in training at Saltford, 1914. 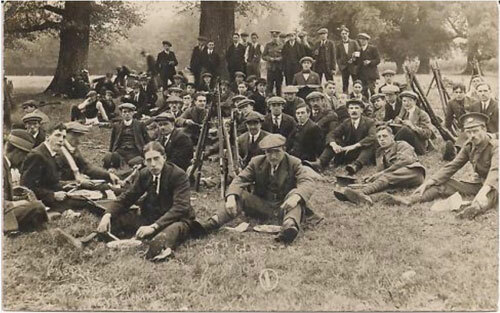 Wounded soldiers on a convalescing daytrip to Saltford, c.1917. The article in the 8th July 1916 edition of the Bristol Times and Mirror lists Saltford's servicemen who had enlisted at that time (more enlisted thereafter) with portrait photographs of many of them. The article also includes a description of village life at the time. 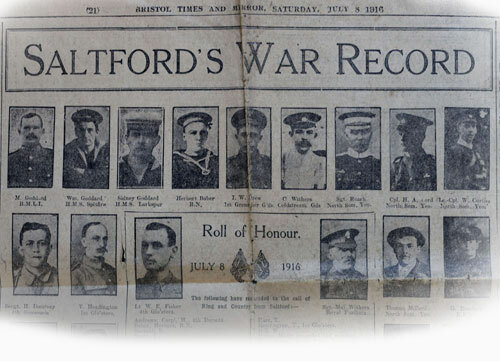 Click here for article: Saltford's War Record etc. 8 July 1916 (pdf 1.2MB opens in new window). This also appears in our Document Library. 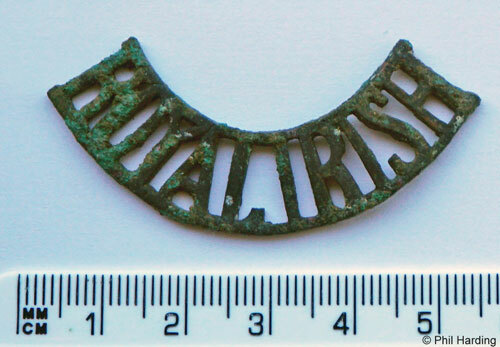 We do not know if this badge belonged to a Saltford resident or, more likely, to a visiting soldier either in Saltford on a convalesence visit or associated with the holding of horses on land on the north side of the High St before being sent across the English Channel for service on the front line. Conditions on the Western Front were so appalling that motor vehicles were largely unsuitable. The sourcing of horses, for transporting military equipment and for the cavalry to ride to the front line before dismounting and continuing on foot, and mules and donkeys, for transporting equipment, was the responsibility of the War Office. During the initial stages of the war the English countryside was virtually emptied of horses which in turn had a huge impact on farming families who were reliant on their horses as working animals before motorised vehicles were in common use in the countryside. 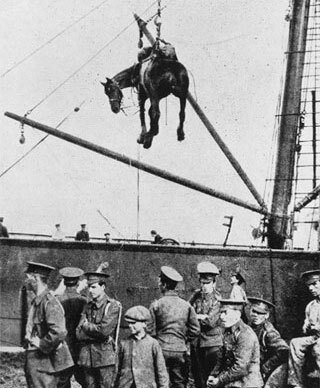 Horses, mules and donkeys were held at various locations including Saltford and then transported to the ports where they were hoisted onto ships to cross the Channel. In addition to horses, a large number of mules were kept in Saltford before being sent over the channel for the war effort. These were held by the military authorities in the 'Triangle of Saltford', an area of land approximately 19.5 acres bounded on the south side by the Bristol to Bath main (A4) road, on the north by Norman Road (then known as Boyd Lane, later Mission Hall Lane) and on the east side by Beech Road (then known as Crown Lane). This 1915 WWI Military Telescope was owned by Bert Brely, a close relative (Uncle) of Saltford life long resident John Dunford. We do not know who used it during WWI. Made by optical manufacturing firm R & J Beck Ltd of London in 1915 it is made from brass and clad in leather. The company made telescopes and trench periscopes for army officers in the First World War. When fully extended this telescope (Mark IV, serial no. 17677) measures 890mm (35 inches) in length and 290mm (11.5 inches) when closed. Guide provided for local Boy Scouts. Click here for pdf larger version. During WW1 with the threat of air raids from German airships and airplanes many observers were needed to keep watch from hilltops and other vantage points to raise the alarm if airships or bombers were seen heading towards Britain. Boy Scouts were recruited to help and our local Boy Scouts then had their HQ in Keynsham, organised initially on an informal basis in 1909 with the first formal troop formed in 1916; Saltford's own Boy Scouts troop was not formed until 1927. 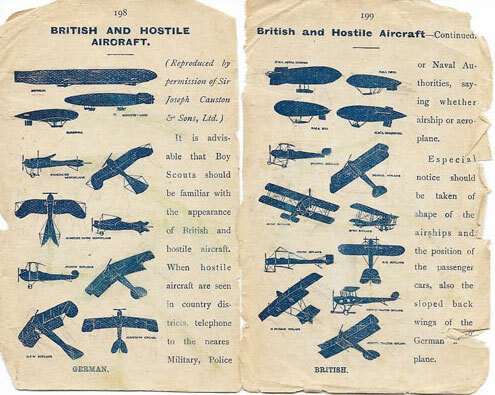 This original aircraft spotting guide was owned and used in Bristol by Boy Scout Reg Dunford (father of Saltford resident John Dunford) during WW1. Click here to see larger version of guide and manuscript notes on the reverse (pdf opens in new window):- WW1 Aircraft Spotter Guide. F R Calcutt, ARP Captain, during during WWII. Frederick Rich (Eric) Calcutt was born in Bristol in 1895. His father was a 'commercial traveller in oil and colour' and according to the 1911 census the family were then living in a ten-roomed house in Redland, Bristol and had a live-in servant, so were clearly relatively well-off. Eric joined the Royal Flying Corps (RFC) in 1915. His rank was Air Mechanic class 2 in the RFC, and Air Mechanic Class 3 in the RAF (the RFC became the RAF in April 1918). His occupation in the RAF was Driver earning 2 shillings (10p) a week. Eric's service record shows that he was in Mesopotamia from 23 June 1916. Mespotamia, now Iraq, was strategically important and a source of oil supplies, vital to the Royal Navy. When Turkey entered the war on the side of Germany in October 1914, Britain opened a military front in Mesopotamia to defend her interests. In addition to ground troops, a small number of RFC personnel and aircraft were sent to the area, initially for reconnaissance purposes - aircraft were particularly valuable in the large areas of arid desert which formed the front. However, as on the Western Front, as the war went on the role of aircraft changed, and bombing raids were carried out on enemy airfields and positions. Conditions in Mesopotamia were extreme: very high temperatures, flooding, flies and mosquitoes caused very high levels of sickness, and the temperatures, strong winds and sand storms wreaked havoc with the aircraft. Initially, the aircraft sent to the area were insufficient in numbers and in poor condition, but more and better machines were sent later in the war. It is not known how long Eric stayed in Mesopotamia, but it may have been until he was discharged in November 1919. Eric married Mercy M Collard in Bristol in 1922. During WWII he was an ARP warden with the rank of Captain; at the outbreak of war he was living with Mercy at 57 West Town Lane, Bristol. Eric worked at Fry's all his working life, and was instrumental in setting up the Fry's Pension Fund. Subsequently he was very involved in pensioners' welfare. He was Captain of Saltford Golf Club in 1958 and a long term resident of Saltford (Coppice Road and Uplands Road). Saltford Parish Council added new railings etc. 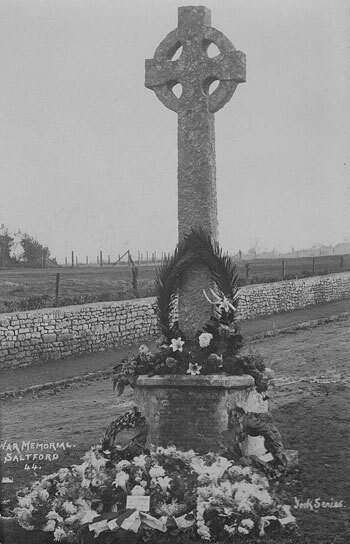 These Saltford men who made the ultimate sacrifice are listed on Saltford's War Memorial. Two, Sidney Goddard and Henry Mitchell, are buried in St Mary's Churchyard. Major Arthur Harold HOBBS 1st Battalion, the Welsh Regiment, son of Lt Col Arthur & Agnes Hobbs of The Mount, Saltford, was the first Saltford casualty. Killed in Action (K.i.A.) during the first battle of Loos on 2nd October 1915, aged 34, he is listed on Loos memorial. His family commissioned the stained glass window in St Marys Church, Saltford in memory of him and the Saltford fallen. Privates Reginald LOWMAN and Francis WEYMOUTH both joined as infantrymen before transferring to the newly formed Machine Gun Corps. Reginald, son of Joseph & Minnie of Maud Buildings, was the youngest Saltford casualty; killed in action aged 19 on the Somme on 22nd March 1918 he is listed on the Pozieres memorial to the missing. Francis was born and enlisted in Saltford where his parents lived at Thorncliffe Cottage; he died of his wounds 19 days later on 10th April 1918 aged 20 and is buried at the Etaples war cemetery. Captain John GILMORE and 2nd Lieutenants Henry GALE & Frank HAYCROFT enlisted as soldiers before being commissioned: John, husband of Gladys, enlisted in Sept 1914; commissioned in Feb 1915, he was K.i.A. at Thiepval, on 22 Aug 1916, aged 25. Henry, fiancé of Gladys Hudson, enlisted in 1915; commissioned in June 1917, he was K.i.A. on the Somme, on 21 Mar 1918, aged 23. Frank, son of Alice, lived at The Craig, Saltford, was also killed in action during the 3rd Battle of Ypres, on 10 Aug 1917, aged 27. 2nd Lieutenant Henry (Charlie) TARR, the oldest casualty, lived with his wife Charity at the Tunnel House. Enlisting in 1917 he joined the Egypt Expeditionary Force in Feb 1918. He died at Ras-El-Tin hospital in Feb 1919 just before his 46th birthday and is buried in Alexandria. Three members of the GODDARD family lived at the Jolly Sailor Public House as they enlisted in the Royal Navy between 1903 & 1907. Sidney died whilst serving on HMS LARKSPUR in November 1915 and is buried in St Mary's Churchyard in Saltford. William joined aged 17; he died aged 30 on 31st May 1916 whilst serving on HMS SPITFIRE. Maurice enlisted as a Royal Marine in 1907; he died aged 32 whilst serving on HMS CORNWALL in September 1916 and is buried at the Kranji war memorial cemetery in Singapore. Private Henry MITCHELL died from his wounds, aged 25 at the Wiltshire Regiment Depot on 14th October 1917. The only son of shopkeepers George and Selina Mitchell of South View House Saltford, Henry is buried in St Mary's Churchyard, Saltford. Trooper Herbert LOCK, son of local farmers James & Sarah Lock of Wick House, was K.i.A aged 42 on 14th November 1917 whilst serving with the Wellington Mounted Rifles of the New Zealand Expeditionary Force. He is buried in Ramleh Cemetery, Israel. Lance Sergeant Harold ANDREWS of Broadmoor Cottage, Saltford worked as a market gardener before he joined the Dorset Regiment. Harold died of his wounds, aged 21, on 23rd November 1917 and is buried in the Jerusalem war cemetery. Private Edward BARNETT was born and raised in Saltford before he moved to Frome to work as a general labourer. The son of Sarah who lived at Saltford Brass Mills and husband to Florence, he died aged 24 on 19th July 1916 and is listed on the Thiepval memorial. Gunner Lionel KING was 20 when he died alongside all but two of the 845 crew of HMS VANGUARD when her armament magazines detonated in Scapa Flow just before midnight on 9 Jul 1917 in one of the most catastrophic accidental explosions in Royal Navy history. Private A SKINNER and Private Oliver DUKES served with the Somerset Light Infantry: Pte Skinner was killed in action on the 19th December 1915 and is buried in the Chappelle d'Armienteres military cemetery. Oliver was also killed in action, aged 24 during the battle of the Somme on 3rd September 1916 and is buried at Guillemont cemetery. 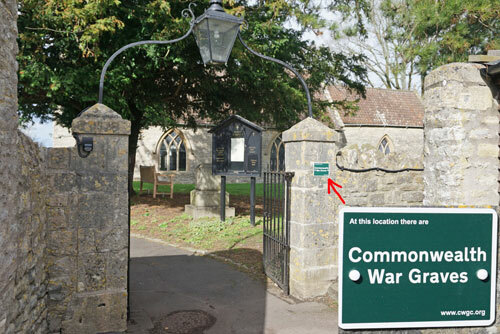 installed at St Mary's Church, Saltford, March 2019.
added in 2018 - see below. Front row (L to R) :- Corporal G Camm; Corporal L J Whittock; Corporal Jack W Owen (Estate Manager at Burnett); Lieut A J Membry; Major W S Scammell (Company Commander); Lieut F C Smailes; Sgt K O Harris and Corporal A E Taylor. 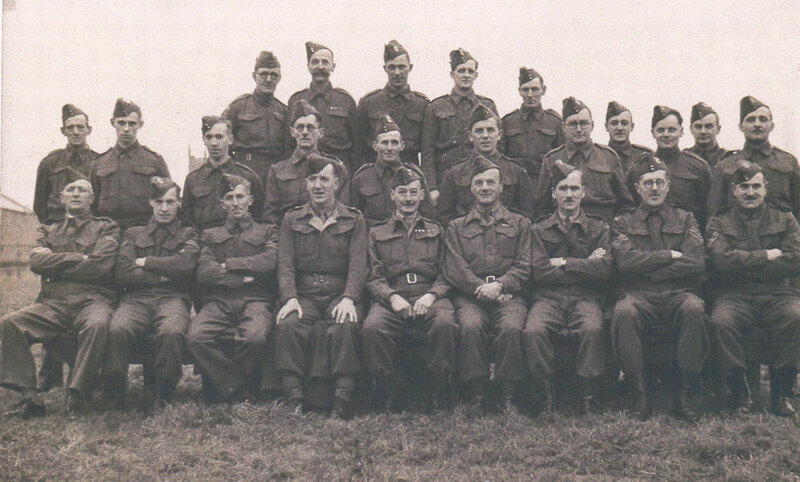 Centre row (L to R) :- Privates C J Lyons, Ivor L Stabbins; J M Whittock; N E Bookman(? ); William H Stabbins (Ivor's father); F Ryan; W E ...mas(? ); D L Price (? ); E E Vowles. 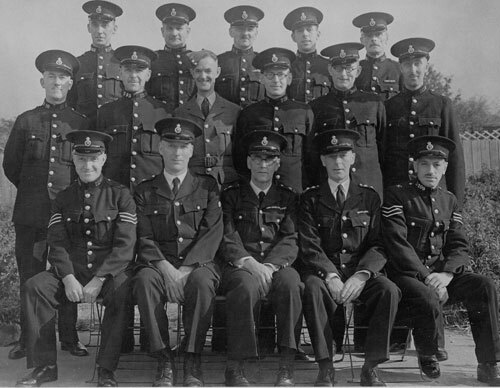 Back row (L to R):- Privates: Thackway; E T Fox; D H White; G G Brearley; F J Balcombe; E Wiggins; C E Jenkins. 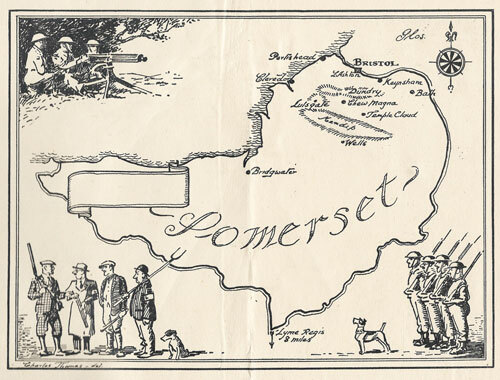 During World War II the area of the 7th Somerset Battalion Home Guard covered 50 square miles and substantially all of the area on the south side of the River Avon between Bristol and Bath. This was broken down into 13 "Sections" and, as recorded in July 1940, Keynsham was Nos. 1, 2 and 3 Sections (totalling 124 men), Saltford was No. 4 Section (46 men) and Burnett and Chewton was No. 11 Section (12 men). 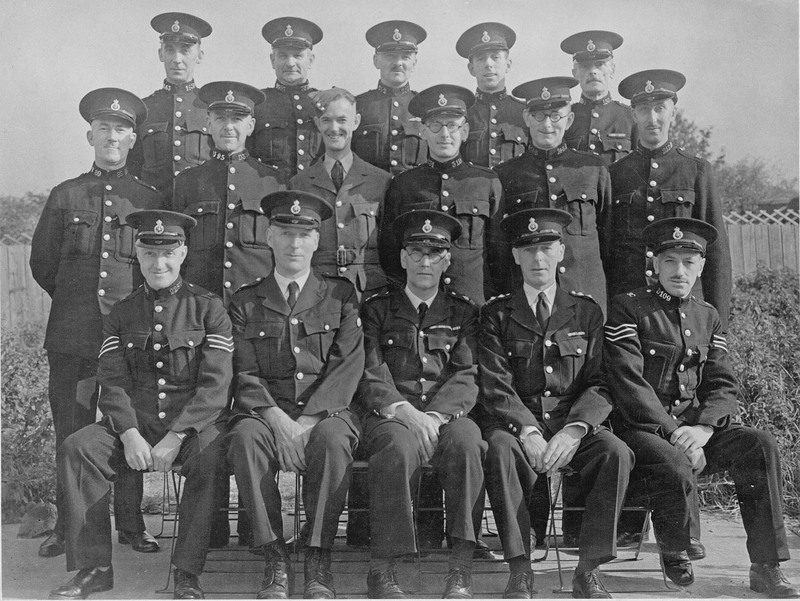 On 16th May 1940 Anthony Eden, the Secretary of State for War, broadcast the decision to form a force for Home Defence, to be called the Local Defence Volunteers (LDV) and asked "all patriotic men to enrol at their local police stations". Amusingly, the LDV was known by some as "Look, Duck and Vanish". 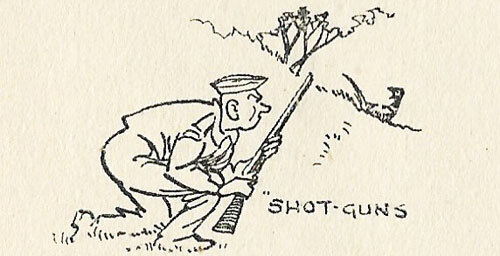 LDV changed its name in August 1940 to the Home Guard. Five platoons were formed in the wider Bristol area, one in each of the five Police Districts in the Long Ashton Police Division; No. 2 Platoon was Keynsham Platoon under Capt. Scammell. 13 Sections totalling 455 men were formed within No. 2 Platoon and the Saltford Section (No. 4 Section) reported having 46 men in July 1940. On 9th July 1940 the overall Long Ashton Company became a Battalion, the 7th Somerset Battalion Home Guard, and the Platoons including Keynsham became Companies. The existing sections were grouped into Platoons with Platoon Commanders. No. 2 Platoon under Mr P Grosset, D.F.C. covered Sections 2 (Keynsham), 4 (Saltford) and 11 (Burnett and Chewton). Until weapons such as rifles started to be supplied, the men armed themselves initially with shotguns, axes, heavy sticks, and farm implements such as pitch forks. The main ideas were to form village sections for observation, and mobile sections for fighting any enemy that might arrive; to select good observation points to be manned from dusk to dawn; and to prepare positions and ambushes - all on a voluntary basis of six hours per man per week. Anyhow, off we all went to try and get something working. There were no enrolment forms, no rifles, no ammunition - in fact, no anything! Only a great determination that no hostile enemy should set foot here without being seen and reported, and that he should be hit on the head with anything handy at the earliest possible moment he could be reached by a British hand and arm. The official instruction was that every Volunteer should have an axe or loaded stick, to be provided by himself. 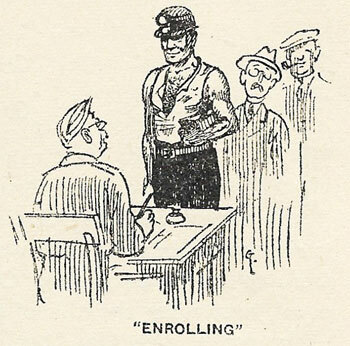 The enthusiasm was tremendous and people were already asking what the indefinite "they" were going to do for the Home Guard in the way of weapons, training, drills, instruction, and in fact, soldiering complete in a week; but of course nothing happened in this way for months. ...The first reported bombs arrived on 27th June, 1940, when five fell close to the Marksbury Post on the night of 26th/27th. The account by Saltford resident Ivor Stabbins (1926 - 2012) of growing up in Saltford during the 1930s and 1940s provides a fascinating and light-hearted insight into Saltford life and in particular the local Home Guard that he joined (under age at only 15) in 1941. Lt R E Cornick; Lt A J Membry; 2nd-Lt F C Smailes. L/Cpl K R Baber; Ptes W Bailey; F J Balcombe; G G Brearley; N E Brookman; J D Buttle; Cpl G Camm; Ptes F G Davis; R Elliot; L/Cpl N S Emmerson; Ptes P E Ford; E T Fox; W H Greenslade; Sgt K J Grimes and K O Harris; L/Cpl A G Hembrow; Ptes C E Jenkins; C J Lyons; P C Minty; W T Nicholls; A R Norton; Cpl J W Owen; Ptes D L Price; S G Price; C L Rose; W J Ryan; F J Smith; I L Stabbins, W H Stabbins; W W Strong; T Stephens; W H Stuckey; Cpl A E Taylor; L/Cpl A W Thackway; Cpl D H Thorne; Ptes P G J Turville; E E Vowles; D H White; G R White; E C Wiggins; H W Wilkinson; E G Willis; J M Whittock; Cpl L J Whittock; Pte A J Woodham. Information supplied by Margaret Stabbins from her late husband Ivor Stabbins' collection of papers, notes and books (2017). The letter below from Noel Flower, owner of Manor Farm (Saltford Manor House), to Mr Cecil Ewins, Hon. Secretary, Saltford Boy Scouts Group Committee, gives a fascinating glimpse of life in Saltford during WWII. Noel Flower had allowed free use of the Manor Farm to Saltford Scouts as their Headquarters from January 1939. The reference in Noel Flower's letter to "50 Incendiaries put out by 2 Scouts in the Home Field and Yard" and "reflected pride" that "their Good Deed should have happended on my property" illustrates how Saltford Boy Scouts helped the village during the war. Silver AFS badge c.1939 (18mm wide). The Local Auxiliary Fire Service (AFS) also had a role in keeping watch for fires arising from air raids and putting them out. This c.1939 sterling silver AFS buttonhole badge (later AFS badges were made from base metal) is thought to have been owned by Reg Dunford (father of Saltford resident John Dunford). 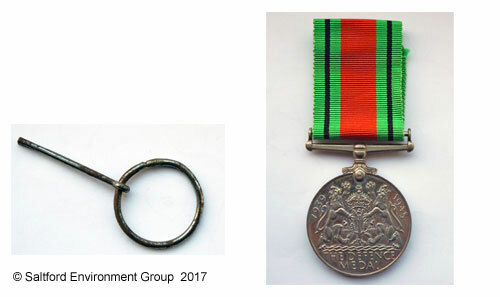 Members of the AFS during WWII were unpaid part-time volunteers as part of Civil Defence engaged in fire watch patrols, especially at night, and for responding to fires caused by enemy air raids. The AFS was merged with the regular fire brigades to become the National Fire Service (NFS) in August 1941 to rationalise and improve the response to fires caused by enemy air raids and to standardise organisation and equipment. Back row: Mr Curtis, Mr William George Witchell, Mr Parsons, Mr Williams and Mr Fred Harding. Centre row: Mr Colledge, Mr Young, Mr Pratt, Mr Lovell, Mr Fursland (played for Saltford Cricket Club), and Mr Lyle (manager of the local Co-Op store) - query on Messrs. Pratt and Lovell. Front row: Mr Milton, Mr Sabin (Asst. Scout Master of Saltford Scouts), Mr Gibbons, Mr Wilkins and Mr Davidson. 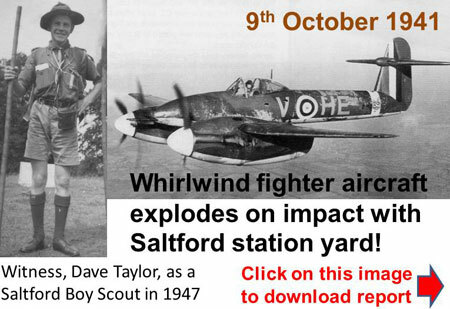 An article giving a graphic eyewitness account of the day in October 1941 when a Westland Whirlwind fighter crashed into the weighbridge at Saltford station and exploded. The article paints a picture of the important part Saltford station played in village life in the 1940s. Click on image or here to open document (pdf opens in a new window). 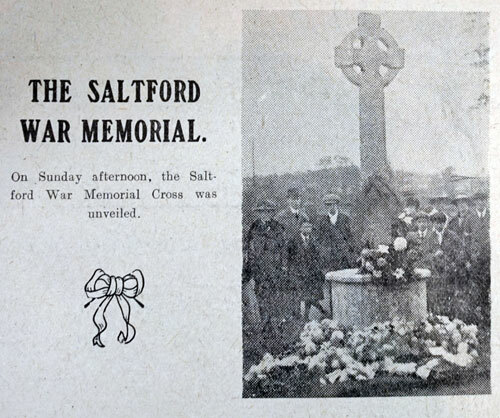 These Saltford men who made the ultimate sacrifice are listed on Saltford's War Memorial. Sergeant Hamilton is buried in St Mary's Churchyard. 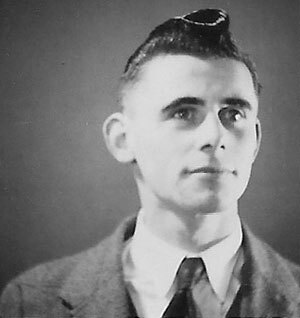 Aircraftman 1st Class John Canning LEWIS, 240 Squadron RAF, was the first Saltford casualty of the War. Son of George and Marie Lewis of Saltford, John was 23 when he died on 3rd November 1939. Able Seaman Jack KELLY served in the Royal Naval Special Reserve. He was 22 when he perished with 1,414 of his shipmates when HMS HOOD was lost during combat with the German battleship BISMARK in the Denmark Strait on 24th May 1941. The son of Mr and Mrs Ernest John Kelly, Jack is listed alongside the rest of his crewmates on the Portsmouth Naval Memorial. Flying Officer STEER died on 17th July 1943 serving as part of the RAF Volunteer Reserve with 415 RCAF Sqdn. Son of Claude & Blanche and husband of Marjorie, of Redland, Gloucestershire, he is commemorated on Panel 129 of the Runnymede memorial. 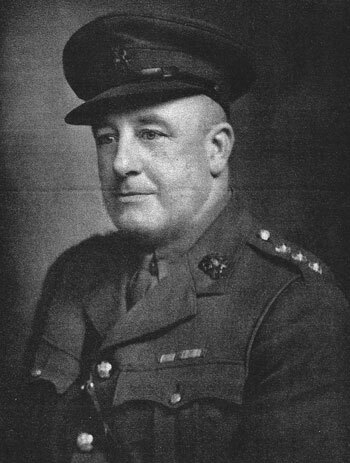 Captain ROGERS served with 2nd Bn Gloucestershire Regiment. He was killed on 29th July 1944 aged 30. Son of Mr and Mrs Frederick Willes Rogers and husband of Olga, of Bournemouth, Hampshire, he is buried in the Hottot Les Bagues Cemetery. Lieutenant John Hugh HETHEY was the son of Mary Gray Michils of Saltford. He served with the Royal Armoured Corps and 5th Royal Inniskilling Dragoon Guards before his death on 27th August 1944 and is commemorated on Panel 1 of the Cassino Memorial. Sergeant HAMILTON, son of Herbert & Nellie and husband to Rosemary, was the last Saltford WW2 casualty. He died on the 19th December 1945 aged 32 whilst serving as part of the Royal Artillery 3 Survey Regt and is buried in St Mary's Churchyard, Saltford. emerged from the Iron Age to how it is today.